Needham lacrosse players celebrate with the championship trophy after defeating Longmeadow, 8-5, for the Division 1 title on Saturday afternoon at BU’s Nickerson Field. No matter how many times a Longmeadow attack sliced and dodged their way through the defensive 8-meter zone Saturday afternoon, they were never able to escape a swarming Needham D.
That commitment to keeping the ball out of the net paved the way for an 8-5 victory for Needham in the Division 1 girls’ lacrosse championship game at Boston University’s Nickerson Field. Longmeadow (23-2) leaned on its elite athleticism to outlast Franklin, 12-6, in the state semifinals. But on Saturday, Needham (23-3) endured an arduous second-half assault to secure the victory. Rocket defenders buzzed with activity, moving in synch with one another and seamlessly communicating in front of the net to pass off cutters. They rushed the ball as a pack in the open field and rarely faltered from start to finish. 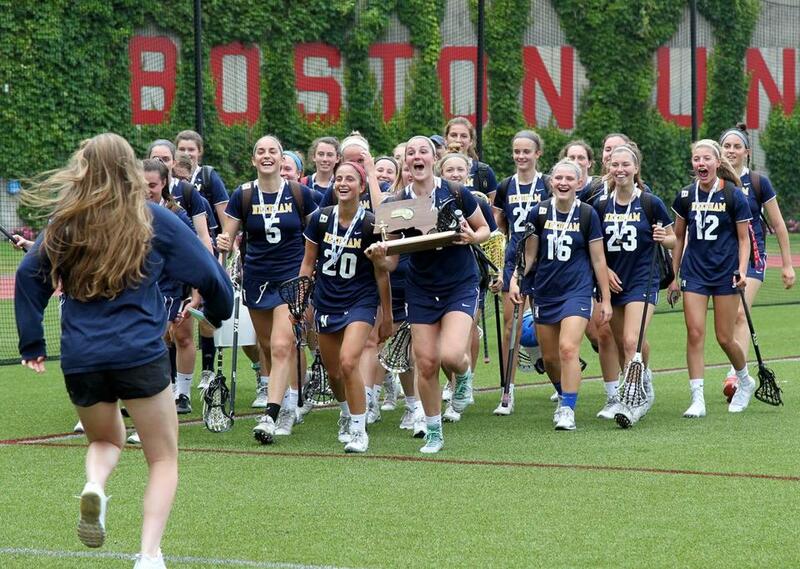 “We’ve leaned on them pretty heavily all year,” said Needham coach Beth O’Brien. In the final 10 minutes, senior goalie Liz Vallatini had two critical stops, both to preserve a two-goal lead. Sophomore Maeve Barker (two goals, assist) then iced the win, scoring with 1:28 left in the game. Conley (two goals, one assist) and sophomore Callie Hem had two goals apiece for Needham. The championship capped what has been an emotional six months for O’Brien, her family, and the Rocket program. In December, her husband, Joe, died after a six-month battle with cancer. He was a presence at every game. The players dedicated their season to him. The title was the first in O’Brien’s 15 years as head coach. The Rockets had won the state championship the season before she arrived. “For me, it’s obviously such a great thing after such a tough year,” O’Brien said. “But, more importantly, I wanted it for these kids. 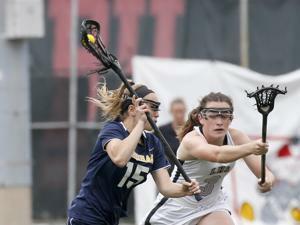 Needham's Maeve Barker (15) shoots on net in Saturday’s Division 1 state championship game against Longmeadow at Nickerson Field. Ryan Hathaway can be reached at ryan.hathaway@globe.com.